When Frederick Lucas passed away in October 1855, John Wallis, a convert to Catholicism from Anglicanism, purchased the paper. Under Wallis, the Tablet was on good terms with the Archbishop of Westminster, and became a semi-official forum for the publication of papal documents. During his proprietor-editorship, articles and editorials continued to lament that Catholics were not only treated worse than other Christians, but also worse than Jews. For example, in June 1857, the newspaper argued that whilst English Catholics have been faithful servants to the Prime Minister, he in turn opens his arms to Jews, but treats Catholics with disdain. A month later, another editorial argued that Jews, unlike Catholics, have foreign blood in their veins, and yet are treated as favoured individuals, even though they are, quote, “of another race.” The paper reported that “the Jew” is “of another race, and his blood pure from admixture with the Saxon, Norman, or Celtic; but notwithstanding the absence of ‘kith and kin’ in the matter, he is the ‘Dowb’ of the Liberals.” According to the editorial, “we who profess the Catholic faith (which the Jew hates), of undoubted English, Irish, or Scottish blood, whose origin is the same with that of the Liberals, who have no other country … cannot excite the millionth part of this sympathy.” It concluded that Catholics, who “have not a drop, probably, of foreign blood in their veins,” find themselves in a position inferior to the Jews. The Mortara Affair was an incident in which a six year old Jewish child, Edgardo Mortara, was forcibly removed from his family in June 1858 by the Carabinieri (the military police of the Papal States), placed in the care of the Church, and later adopted by Pius IX. This was because a Catholic maid (Anna Morisi), supposedly afraid that Edgardo was about to die, illicitly baptised him when he was an infant – or at least claimed to have done so. Years later she revealed this to Father Feletti, the inquisitor in Bologna. Whether Morisi really baptized Edgardo Mortara as claimed, or fabricated the story during her interrogation by Father Feletti in 1857, remains unknown. There were certainly inconsistencies in her account, which were highlighted during the trial of Father Feletti in 1860. Nevertheless, her story was accepted by the Church. The matter was referred to the Holy Office, which declared that the baptism was valid, and that according to papal law the boy must thus be removed from his family and brought to the House of the Catechumens in Rome to be raised as a Christian. This episode is examined in detail by David Kertzer in The Kidnapping of Edgardo Mortara (New York: Vintage, 1998: [link]). Significantly, the Mortara episode was also reflected upon by the Tablet. In October 1858, after a wave of indignation across Europe in response to the abduction, a Tablet editorial stated that “honest Catholic journalists” can say nothing about the Mortara affair, which Protestant readers will find “gratifying.” It was necessary, argued the editorial, to take an “unpopular” stand, despite the inevitable criticism. According to the Tablet, the family had brought the problem upon themselves, as they had disregarded the law forbidding them to employ Christian servants. The young maid had simply wanted to make heaven available to Edgardo, and thus had validly baptized him. According to the paper, the young Mortara child was “no longer a Jew but a Christian,” and it was therefore quite right that he be removed from his parents in order to protect his soul and make sure they do not use violence to force him to abandon Christianity. The abduction was thus transformed into a case of the Church defending an innocent child in his free “choice” of religion, against the unreasonable demands of his parents. According to a report in the Tablet on the 30th of October, the agitators who insist that the young Mortara child, “a baptised Christian, arrived at the age of reason,” should be surrendered to his father, and raised as a Jew, are in essence arguing that a “Christian child has no right to be protected in his religion.” The Tablet suggested that those who argue that the father has a “right to force his own religion on the child,” do so at the expense of the “interests of the child”. A week later, the paper argued that “the child Mortara has acquired rights which no human power can take away”; “the act which made him a Christian is irrevocable”. And the week after that, an article in the paper observed that when reading about the Mortara case in foreign journals, one must keep in mind that many of them are owned by Jews, and that “Hebrews and Protestants will hunt in couples when Popery is on foot.” (Link for more information on the Tablet and the Mortara Affair). The Tablet continued to build upon these themes during the next few years. For example, the Tablet suggested that the residents of Rome were living under “the old law”, rather than the New Testament. It stated that “our rulers are Jews, our teachers are Jews, our editors and bankers and tradesmen are Jews, and it will be by a special dispensation of mercies if we do not all wake one morning and find ourselves talking Hebrew and going to the synagogue instead of the [Church].” The Tablet suggested that if things continue as they are, the Jews will soon become the owners of Rome and Italy. The Tablet also argued that Jewish teachers – supported by Protestants and Freemasons – were pushing their way into the schools and colleges of Rome, and introducing “Judaic,” “atheistic” and “infidel” teachings. Around this time, the Tablet also invoked images of Pharisees and crucifiers. For example, in 1873, the Tablet suggested that English journalists and statesman were like the Jews who clamoured for the crucifixion of Jesus. “Our modern Secularists are not even original,” the paper reported, as “in fighting against the spiritual authority, established by God, … they only imitate the perfidious Jews.” And in 1874, the Tablet argued that English Protestants, with their “neutralized Christianity” and denials of Christ, were like the Pharisees. According to the Tablet, those who say down with the Church, are like the Jews who called for the crucifixion of Jesus. Considering the Tablet’s earlier criticisms of Jews and Disraeli, the Tablet’s sudden U-turn requires some explanation. It seems that the Vatican and the British government were both concerned that their respective interests in the region might be jeopardised if Russia succeeded in defeating the Ottoman Empire. For example, the Suez Canal in Egypt, a vassal state in the Ottoman Empire, was an essential link between Britain and India. Catholics enjoyed a measure of latitude in the Ottoman Empire, whereas the scars of persecution under Russia, especially in Poland, were still raw. William Gladstone, Disraeli’s political opponent, was also harshly critical of the Catholic Church in the 1870s following the First Vatican Council. These factors led the Tablet to defend and support Disraeli, and refute accusations that Judaic sympathies lay behind his policies. The U-turn however did not last long. During the 1880s, the Tablet quickly slipped back into a pattern of criticizing Jews, accusing them of dominating the education systems and money markets of Europe, and turning the University of Vienna into a “Jewish seminary,” and destroying the Union Générale bank. In January 1895, the Tablet contained a report in its Paris news section, stating that “there can be little doubt that the trivial punishment inflicted on Captain Dreyfus,” is owing to “the fact that he is both a Freemason and a Jew.” According to the report, “while in England the Jews are a harmless and inoffensive tribe, or at most work unaggressively, in France they are the declared and open enemies of the Christian religion.” According to the Tablet, the Jews use their wealth and talents to obtain official positions, which they then use to attack the Catholic faith at every opportunity. “The combination of Judaism with Freemasonry is irresistible,” the report stated, and “it rules France with an iron-gloved hand”. 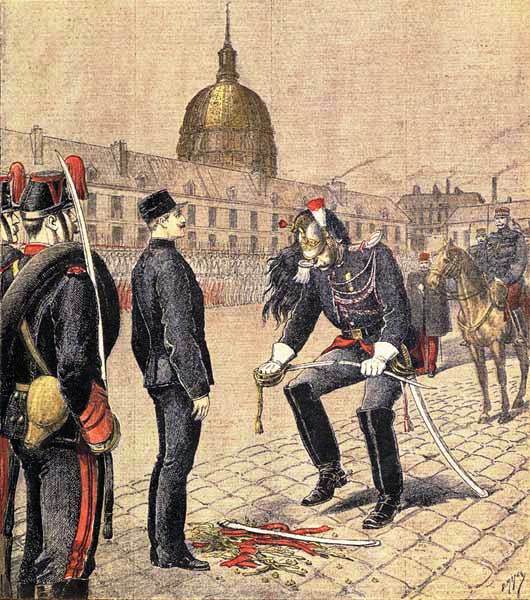 The report concluded that “had a Christian been found guilty of the treachery of Captain Dreyfus he would have been shot,” whereas Dreyfus “escapes with a comfortable exile”. In summing up, during the second half of the nineteenth century, Jews were criticized, caricatured and stereotyped under each of the Tablet’s three owner-editors. Jews were stereotyped as greedy, exploitive, foreign villains, bent on political revolution, undermining Christian civilization, plundering the churches, and de-Christianizing Rome. Jews were accused of monopolizing the banks, stock markets, and the Press. A link was often made between Jews and Protestants, with Protestants labelled the enemies of Christianity, and criticized for embracing and defending Jews. Jews were also linked to Freemasons, as two forces supposedly bent on destroying Christian civilization. This was especially the case during the late 1860s and early 1870s, when the paper sought to explain the destruction of the Papal States, and during the Dreyfus Affair in the 1890s. The Tablet was more ambivalent during the 1880s and early 1890s, expressing sympathy for the plight of Jews in Russia, whilst also repeating traditional stereotypes about Jewish greed and deviousness. The only major exception to this pattern of ambivalence or antipathy occurred during the late 1870s, when the Tablet defended Disraeli during “the Bulgarian Horrors” and the Russo-Turkish War, and defended his policies from the accusation of being driven by “Judaic” sympathies. In his book on G. K. Chesterton’s so-called “holiness” (an edited collection of essays by various contributors), William Oddie argues that Chesterton was not only a saint but also a “philosemite.” Whilst I have looked at some of Oddie’s arguments elsewhere, I thought it would be a good idea to bring them together and examine them afresh. One of William Oddie’s arguments is that Chesterton could not have been an antisemite because on a number of occasions he defended Jews from antisemitism. According to Oddie, Chesterton felt protective feelings for Jews from his childhood onwards. He presented a diary entry, dated 5 January 1891, which stated that Chesterton felt so strongly about some vicious acts of cruelty to a Jewish girl in Russia that he was inclined to “knock some-body down”. He also quotes from letters by Chesterton’s alter-ego, Guy Crawford (under which name Chesterton published a series of letters). These were printed in the Debater, the magazine of the “Junior Debating Club,” in 1892. In these letters, Crawford discusses his plans to go to Russia to help “the Hebrews” suffering in pogroms. As William Oddie observed, the series of letters ends with “Guy Crawford” siding with a revolutionary mob in St. Petersburg, and leaping to the defence of a Jewish student. The student, who was killed in this fantastical account, was described by Crawford as “a champion of justice, like thousands who have fallen for it in the dark records of this dark land”. The Guy Crawford letters can be found in G. K. Chesterton [Guy Crawford, pseud. ], “The Letters of Three Friends,” Debater III: no.13 (March 1892), 9-11; no.14 (May 1892), 27-29; no.17 (November 1892), 70-71. These examples probably provide a fair reflection of Chesterton’s late teenage attitudes (he was 16 when he wrote the diary entry, and 17-18 when he wrote the “Guy Crawford” letters). However, his childhood and young adult worldview, as with most people, changed as he developed. An example of his developing worldview can be seen in The Napoleon of Notting Hill, published in 1904, when Chesterton was about 30 years of age. William Oddie has himself noted this protean development of views in Chesterton’s life, noting that in this novel, Chesterton expressed “distaste for modernity and progress.” Oddie quite rightly points out that this distaste was “a recent volte-face.” See William Oddie, “The Philosemitism of G.K. Chesterton,” in William Oddie, ed., The Holiness of G.K. Chesterton (Leominster: Gracewing,2010), 124-137 and William Oddie, Chesterton and the Romance of Orthodoxy: The Making of GKC, 1874-1908 (Oxford: Oxford University Press, 2008), 7-8, 80-81. This was not however the only volte-face in Chesterton’s worldview and discourse. He also changed his views about the Jews, and his early protective feelings developed into something which at its best was ambiguous and ambivalent, and at its worst hostile, stereotyping and caricaturing. A relatively early, partial, and by his later standards mild manifestation of this volte-face can be found in his novel, Manalive (1912), which reflected his worldview no less than the letters of Guy Crawford. According to the narrator of the story, “wherever there is conflict, crises come in which any soul, personal or racial, unconsciously turns on the world the most hateful of its hundred faces.” In the case of Moses Gould, the Jew in the novel, it was “that smile of the Cynic Triumphant, which has been the tocsin for many a cruel riot in Russian villages or mediaeval towns”. The transition from innocent victim in Russia to cynic-triumphant was only a partial volte-face. The more complete volte-face would come later in the early 1920s, when Chesterton started to claim that the Jews were persecuting Russians. His narratives about the Jewish tyrant were intertwined with stereotypes about the Jewish Bolshevik. For example, in February 1921, Chesterton observed that there was once “a time when English poets and other publicists could always be inspired with instantaneous indignation about the persecuted Jews in Russia. We have heard less about them since we heard more about the persecuting Jews in Russia”. According to Chesterton, it was not necessary for all Jews to support Bolshevism for it to be a Jewish movement. He stated that “it is not necessary to have every man a Jew to make a thing a Jewish movement; it is at least clear that there are quite enough Jews to prevent it from being a Russian movement”. He made a similar point in August 1920: “There has arisen on the ruins of Russia a Jewish servile State, the strongest Jewish power hitherto known in history. We do not say, we should certainly deny, that every Jew is its friend; but we do say that no Jew is in the national sense its enemy”. The “servile State” was an allusion to Hilaire Belloc’s book, The Servile State (1912). According to Belloc, the servile state is a society in which the majority of individuals and families are forced and constrained by “positive law” to labour on behalf of a tight-knit minority of rich capitalist plutocrats or tyrannical Bolsheviks (i.e. the enslavement of “the proletariat”). Chesterton was implying that Russia had been transformed into such a servile State, run for the benefit of the Jews. See G.K. Chesterton, Manalive (London: Thomas Nelson, 1912), 289; G.K. Chesterton, “The Statue and the Irishman,” New Witness, 18 February 1921, 102; G.K. Chesterton, “The Beard of the Bolshevist,” New Witness, 14 January 1921, 22; G.K. Chesterton, “The Feud of the Foreigner,” New Witness, 20 August 1920, 309; Hilaire Belloc, The Servile State (1912). Oddie also points to Chesterton’s defence of Captain Alfred Dreyfus as further proof of Chesterton’s philosemitism. In 1899, when he was about 25 years of age, Chesterton did (as Oddie rightly notes) write a poem entitled “To a Certain Nation” as a reproach to France for the injustice done to Captain Dreyfus. However, what Oddie neglects to mention is that Chesterton soon reversed his opinion. This volte-face occurred around 1906, when Chesterton was about 32 years of age. In 1906, Chesterton added a note to the second edition of The Wild Knight which reveals that by 1906 he had started to change his position about where the greater injustice lay. The note stated that whilst “there may have been a fog of injustice in the French courts; I know that there was a fog of injustice in the English newspapers.” According to the note, he was unable to reach a “proper verdict on the individual,” which he largely attributed to the “acrid and irrational unanimity of the English Press.” Chesterton maintained this antipathy about Dreyfus and his defenders throughout his life. In letters to The Nation in 1911, Chesterton referred to the Jew “who is a traitor in France and a tyrant in England,” and stated that in “the case of Dreyfus,” he was quite certain that “the British public was systematically and despotically duped by some power – and I naturally wonder what power.” He argued in 1928 that Dreyfus may or may not have been innocent, but that the greater crime was not how he had been treated at trial but how the English newspapers buried the evidence against him. According to Chesterton, “the English newspapers incessantly repeated that there was no evidence against Captain Dreyfus. They then cut out of the reports the evidence that he had been seen in German uniform at the German manoeuvres; or that he had obtained a passport for Italy and then gone to Germany.” Chesterton stated that when he discovered this, “something broke inside my British serenity; and a page of print has never been the same to me again.” In another article (in 1927) Chesterton did defend a Jew, Oscar Slater, from the charge of murder, thereby seemingly showing that Chesterton was not ceaselessly antisemitic. 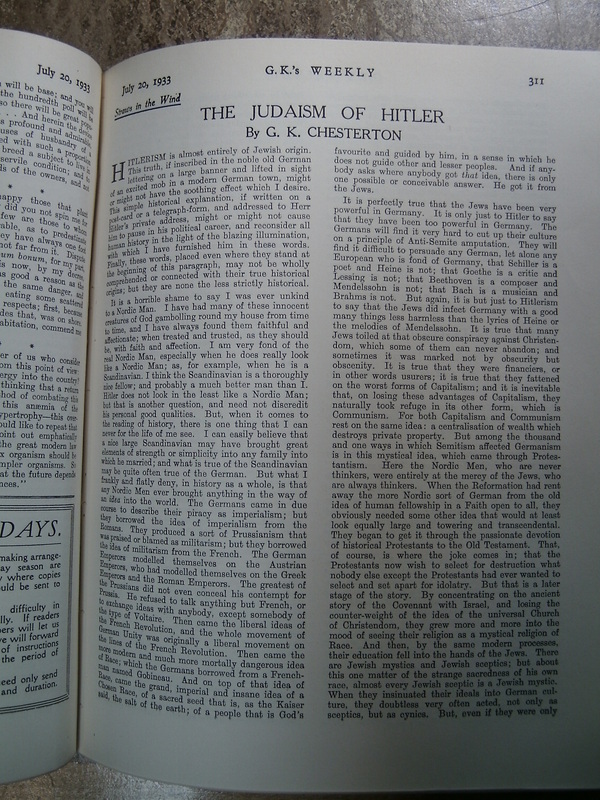 However, seemingly unwilling to defend one Jew without sniping at another, he again repeated as part of this defence of Oscar Slater the accusation that the English newspapers left out “evidence that Dreyfus had appeared in German uniform at the German manoeuvres.” In another article, this time published in 1933, he criticised Hitler and Nazi antisemitism (something he did on a number of occasions as his defenders, including William Oddie, have pointed out), whilst yet again arguing that the English “were never told, for instance, that Dreyfus had got leave to go to Italy and used it to go to Germany; or that he was seen in German uniform at the German manoeuvres.” As Julia Stapleton rightly noted in her book, Christianity, Patriotism, and Nationhood: The England of G. K. Chesterton (2009, 46), it seems that it never occurred to Chesterton to question whether there was any truth in the highly dubious allegations that Dreyfus was seen “in German uniform at the German manoeuvres,” or whether the claims “were suspect and thus beyond the realms of responsible journalism.” See G.K. Chesterton, The Wild Knight, 1st ed. (London: Grant Richards, 1900), 94-96; G.K. Chesterton, The Wild Knight, 2nd ed. (London: Brimley Johnson and Ince, 1906), viii; G.K. Chesterton to the Editor, The Nation: 18 March 1911 and 8 April 1911; G.K. Chesterton, “Dreyfus and Dead Illusions,” G.K.’s Weekly, 25 February 1928, 993; G.K. Chesterton, “In Defence of a Jew,”, G.K.’s Weekly, 27 August 1927, 575; G.K. Chesterton, “The Horse and the Hedge,” G.K.’s Weekly, 30 March 1933, 55. As previously mentioned, William Oddie also points out (quite rightly) that Chesterton bitterly criticised the Nazis during the 1930s. He was in fact a staunch critic of Hitler and Nazi antisemitism. However, Chesterton considered his critiques of “Hitlerism” and Nazi antisemitism to be entirely consistent with his earlier stereotypes of the Jew and his proposed so-called solutions to the so-called “Jewish Problem”. Chesterton believed that Hitler was right to worry about the so-called Jewish Problem, but wrong in his approach to it. As far as Chesterton was concerned, the rise of Hitlerism clarified the urgency of solving the so-called Jewish Problem. Significantly, he not only continued to maintain his antisemitic stereotypes of the Jew from 1933 onwards, he incorporated them into the very articles in which he condemned and criticised Hitlerism. According to Chesterton in July 1933, “it is perfectly true that the Jews have been very powerful in Germany. It is only just to Hitler to say that they have been too powerful in Germany.” Chesterton argued that it will be very difficult for Hitler to persuade Germans to amputate the Jewish contributions to German culture, such as Heinrich Heine and Felix Mendelssohn. “But again,” he continued, “it is but just to Hitlerism to say that the Jews did infect Germany with a good many things less harmless than the lyrics of Heine or the melodies of Mendelssohn.” Chesterton even seemed to believe in the idea of a Jewish conspiracy, for he went on to state that “it is true that many Jews toiled at that obscure conspiracy against Christendom, which some of them can never abandon; and sometimes it was marked not be obscurity but obscenity. It is true that they were financiers, or in other words usurers; it is true that they fattened on the worst forms of Capitalism; and it is inevitable that, on losing these advantages of Capitalism, they naturally took refuge in its other form, which is Communism”. Chesterton repeated the stereotype of rich greedy Jews in other articles that were critical of Hitler. He condemned “Herr Hitler and his group” for “beat[ing] and bully[ing] poor Jews in concentration camps,” but then he stated that “what is even worse, they do not beat or bully rich Jews who are at the head of big banking houses”. Chesterton repeated the stereotype of the pro-German Jew in his critique of Hitler. He asked, “was Hitler really so ignorant, that he did not know that the Jews were the prop of the Pro-German cause throughout the world?” Chesterton criticised Hitler, and then repeated his claim that there is a Jewish Problem. He explained that “there is a Jewish problem; there is certainly a Jewish culture; and I am inclined to think that it really was too prevalent in Germany. For here we have the Hitlerites themselves, in plain words, saying they are a Chosen Race. Where could they have got that notion? Where could they even have got that phrase, except from the Jews?” See G.K. Chesterton, “The Judaism of Hitler,” G.K.’s Weekly, 20 July 1933, 311; G.K. Chesterton, “On War Books,” G.K.’s Weekly, 10 October 1935, 28; G.K. Chesterton, “A Very Present Help,” G.K.’s Weekly, 4 May 1933, 135; G.K. Chesterton, “A Queer Choice,” G.K.’s Weekly, 29 November 1934, 207. For those interested, my recent book, Chesterton’s Jews, contains a thorough examination of the antisemitic stereotypes and caricatures in the literature and journalism of G. K. Chesterton. G. K. Chesterton, The Wild Knight, 1st ed. (London: Grant Richards, 1900), 94-96. G. K. Chesterton, The Wild Knight, 2nd ed. (London: Brimley Johnson and Ince, 1906), viii. G. K. Chesterton to the Editor, The Nation: 18 March 1911, 1004 and 8 April 1911, 58. G. K. Chesterton, “Dreyfus and Dead Illusions,” Straws in the Wind, G.K.’s Weekly, 25 February 1928, 993. G. K. Chesterton, “In Defence of a Jew,” Straws in the Wind, G.K.’s Weekly, 27 August 1927, 575. G. K. Chesterton, “The Horse and the Hedge,” Straws in the Wind, G.K.’s Weekly, 30 March 1933, 55. G. K. Chesterton, “The Duel of Dr. Hirsch,” in G. K. Chesterton, The Complete Father Brown Stories (London: Wordsworth Classics, 2006), 213-224; Bryan Cheyette, Constructions of “the Jew” in English Literature and Society: Racial Representations, 1875-1945 (Cambridge: Cambridge University Press, 1993), 192-193; Dale Ahlquist, G. K. Chesterton: The Apostle of Common Sense (San Francisco: Ignatius Press, 2003), 166. G. K. Chesterton, “The Duel of Dr. Hirsch,” 224; G. K. Chesterton, “The Diabolist,” Daily News, 9 November 1907, 6. G. K. Chesterton, “Dreyfus and Dead Illusions,” Straws in the Wind, G.K.’s Weekly, 25 February 1928, 993; Julia Stapleton, Christianity, Patriotism, and Nationhood: The England of G. K. Chesterton (Plymouth: Lexington Books, 2009), 46.